For all the okra lovers, this will be a treat. Okra Gumbo is a side dish that my Mom made every summer. 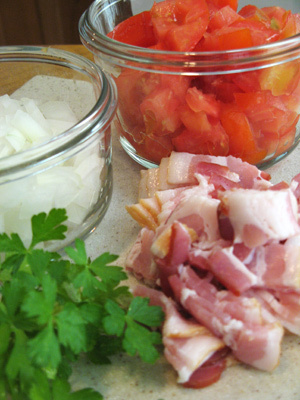 It reminds me of my childhood, Mom in the kitchen frying okra and the wonderful smell of bacon and tomato. I’ve never found any recipe that is quite like Mom’s, and believe me I’ve looked. I’ll have to cook this from memory, I don’t think the recipe is written anywhere and I don’t ever want to forget it. It’s just that good! My first pickings of the summer. 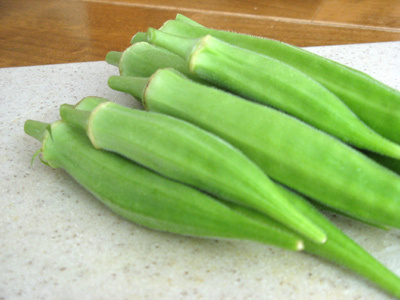 I went out to my little garden patch and was surprised that the first okra pods were ready to pick. Just a couple days ago they were little nubs and I had no idea they would be ready this soon. It was such a little amount, but I was determined to make some gumbo even if it’s just enough for me. I took what I had and cut into small pieces. It made 2 cups. Add a 1/2 cup buttermilk to the okra and let it sit a minute or two. I’ve put together a mix to dredge the okra in. Throw it in a ziplock bag. Make sure to drain the okra with a slotted spoon and then put a few okra in at a time and shake the bag. If you have a small amount like I do you can keep adding it until they are all coated. They will look like this. I prefer to pan fry rather than deep fry but that’s just me. A little of the coating will come off with pan frying, but the crumbs will remain and go in the gumbo just the same. You’ll see what I mean. Pour enough canola oil to coat a cast iron skillet. 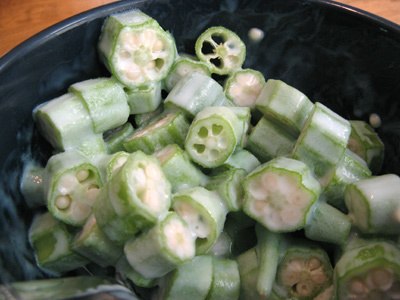 To maintain more coating, layer the okra in a single layer and cook in batches. It will start to brown quickly and need to be turned. It will only take a few minutes to brown and crisp on all sides. If you’re making batches, add a little more oil to the pan before adding the next batch. I couldn’t resist, I just had to have a bite or two. The okra is ready and now it’s time to prep the final ingredients. 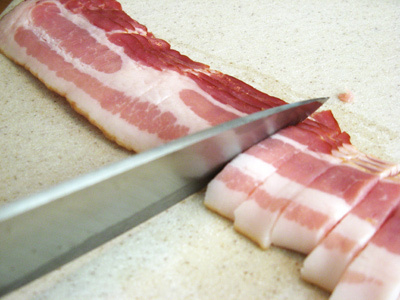 First cut 4 slices of bacon into pieces. I added a large garden tomato, 1/2 onion and some parsley to sprinkle on top. 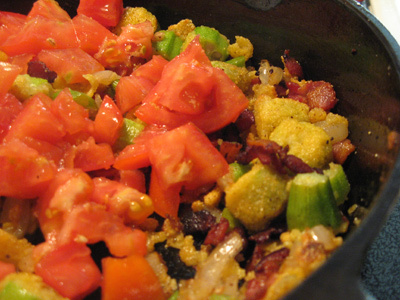 The bacon goes back in the same skillet that we used to fry the okra. Cook just a few minutes on medium high and it will turn brown and crispy. 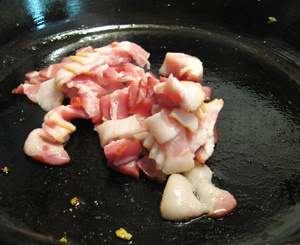 When it’s done, remove the bacon leaving the bacon grease in the pan. 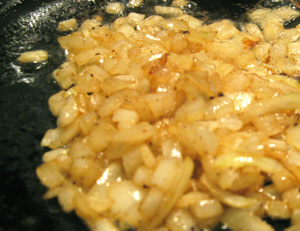 Add the onions to the pan. Stir them around and cook until they become translucent. 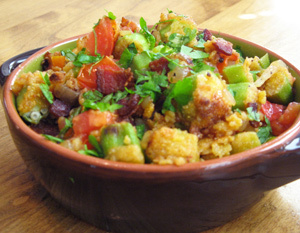 When the onion is cooked, add the okra, bacon and tomato back into the pan and give it a gentle stir. Continue cooking for just a minute while the tomatoes break down. It shouldn’t be mushy. 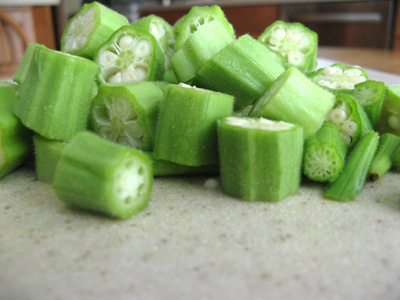 Cut okra into 1/2 inch pieces and place in a bowl. 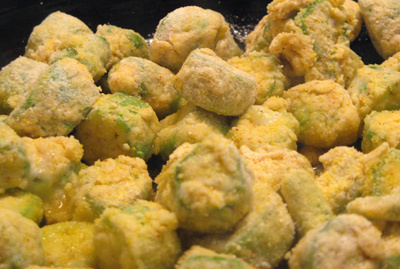 Cover okra with buttermilk and set aside. 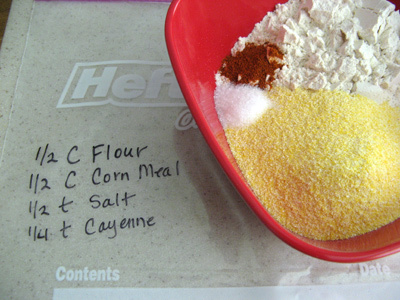 Mix together flour, cornmeal salt and cayenne pepper. Put the mix into a ziplock bag and using a slotted spoon add okra a few at a time. Shake the bag to coat all pieces of okra. Over medium high heat, add enough canola oil to coat the inside of a cast iron skillet. 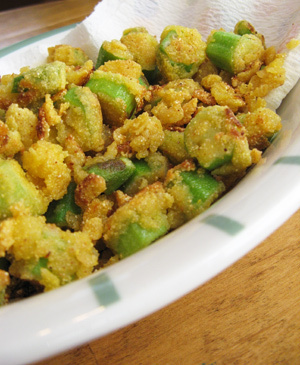 Again, using a slotted spoon add a single layer of breaded okra to the pan and brown. 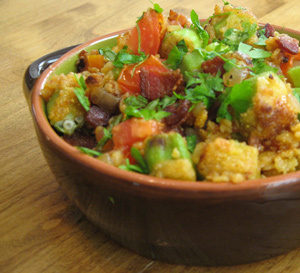 You will want to make this in batches. When the first batch is brown and crisp, remove to a bowl lined with a paper towel. Add additional canola oil to the pan for the next batch. 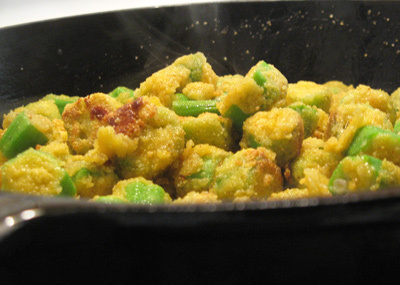 When you have finished the okra, add bacon to the same pan and cook, stirring frequently. 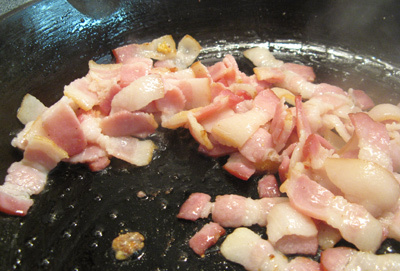 Once the bacon is brown and crisp, remove from pan (leaving the bacon grease) to a plate lined with a paper towel. Add the onion and cook a few minutes until onion becomes translucent. Add the okra, bacon and diced tomato back to the pan along with the onion and stir gently until the tomato starts to break down. Transfer to a bowl and garnish with parsley. Salt to taste. Ideal for summer, I think.